I've been hesitant to share this photo for a while, I'm not sure why...just have. But anyhow, I thought I'd share the story behind it and the somewhat odd coincidences that go along with it. Well, first of all, the man in the picture is Fred Tornow and he is standing in front of my house with a Penny-Farthing bicycle in 1886. No...sorry, let me start over. 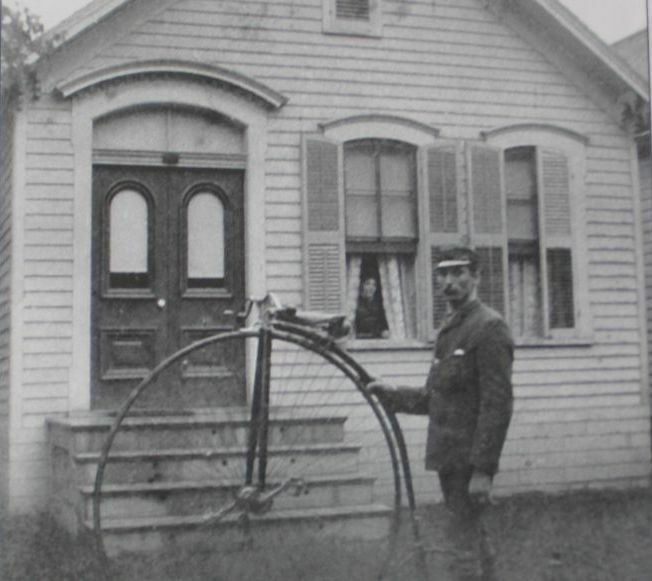 He is standing in front of his house in 1886. The best I can figure is he was the second owner of the house (I'm something like the 9th) and he and his wife (the woman in the window, I presume) lived here for more than 40 years; don't know if they had children but I assume so. Anyhow, you can imagine my surprise and interest when I first came across this photo...and what little I learned about him...more specifically, some of our same interests. He, for example, was one of the early bicycle advocates in Buffalo and rode a really tall bike that probably drew attention; I, of course, am a local bike advocate and ride a really long bike that seems to draw a lot of attention. His job for decades was working as a book binder; I, in turn, love books of all kinds...just the feel of them; my (his) house is filled with them. For recreation he rode his bicycle around the city and took photos and kept a log of them; I, of course, ride my bike around the city, take photos, and keep this blog. Weird huh? Don't know if he liked to cook, though. To see my bicycles parked in the very same spot that Fred Tornow is standing, click here. Joe, this is an incredible photo- thanks so much for sharing! How did you come across it? Thank you for posting it, and the interesting info that goes along with it. A most enjoyable tale. My current home was built in 1923 and is on a street filled with 1880-1900 homes and buildings. I often think of what this street and the life on it was like in 1925. Ha! That is fantastic Joe. And, almost on cue, the hairs on my neck DID stand! The only question now is finding his blog's name. Oh wait, I confusing him with you, and you with the cycling advocate owner of 2222. Dan, I often think the same thing...especially what it was like before cars...their noise and blocking the view of all our beautiful homes, not to mention keeping people off the streets and in their little metal shells. Just an arbitrary year in the future. 2136 would be perhaps a better year to have picked, being 125 yrs. I don't think it will be too long before we see again what our lovely old streets are like to live on without cars .... other than abandoned ones. I would advise folks to buy cargo bikes or other durable, useful bikes while they are still readily available. I suspect that they will get much more expensive in real dollars in the not too distant future. What a great post! It sort of reminds me of a similar story, click my name for a post about visiting a bar in Ireland that was owned by our family, and then see the fifth post comment! Bikejuju...great story also. I find history and genealogy fascinating. Thanks for your comments.